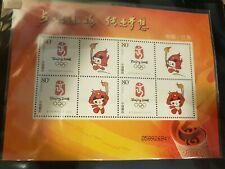 CINA collezione completa olimpiadi di PECHINO 2008 ! LOTTO 39 FRANCOBOLLI NUOVI MNH (16 SERIE COMPLETE) SPORT EMISSIONE 2001-2005-2006-2007. MOLTO RARI ! MINIFOGLIO DI 8 FRANCOBOLLI TORCIA 8 APPENDICI LUOGHI PECHINO. Cina 2008 FDC. GIOCHI OLIMPICI PECHINO. Sheetlet Numbered 0164041A Unmounted Mint. Good Condition, Just Small Thumb Nail Type Crease To Left Hand Margin. Sorry No Checks Or Money Orders. China Benham Cover. see scan for further clarification and condition. Cina - 2008 - 2012 GIOCHI OLIMPICI DI PECHINO a Londra francobollo ALBUM COMPLETO. Outer case & cover is showing signs of sunlight fading / yellowing. Any problems WILL be an honest mistake and I will be happy to resolve it! Pair Of Covers With Band Around, Which Has Been Torn Almost All The Way Across, Covers Clean And In Good Condition. Sorry No Checks Or Money Orders. 1996 issue. Further information on the back of the cover (see 2nd scan). 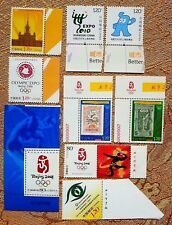 (China 2016 Chinese Olympic Committee - Mint Never Hinged (MNH). Set of 1 value (1v Set): 1.20. You will be back for more! 3) Select each item and 'Add to Basket'. Stanley Gibbons No. : 3322. Scott No. : 1923. China No. : J.103 (6-1). No Exclusions. Condition: Mint Never Hinged. Stanley Gibbons No. : 3327. Scott No. : 1928. China No. : J.103 (6-6). No Exclusions. Condition: Mint Never Hinged. ((1.20) - Volleyball. Set of 2 values (2v Set) You will be back for more! 3) Select each item and 'Add to Basket'. Stanley Gibbons No. : MS3805. Scott No. : 2401. Condition: CTO (Cancelled-To-Order). China No. : 1992-8. Date of issue: 25 July 1992. Date of issue: 25 July 1992. China No. : 1992-8. No Exclusions. Condition: Mint Never Hinged. Glauben Sie, dass der Preis ist nicht richtig?. BEIJING OPERA. ART Of ZHOU XIN FANG.